It is the goal of Mamais Construction to provide the safest jobsite possible for our employees, subcontractors, and the general public. Due to the importance of keeping a safe and clean environment general precautions are always taken to ensure the safety of everyone in the area. It is the belief of Mamais Construction, that a thorough safety policy in effect on our jobsites is an integral part of the construction operation. The safety of our employees is recognized as a very real obligation to us. A well-managed Safety Program contributes to the efficiency and successful outcome of our projects. 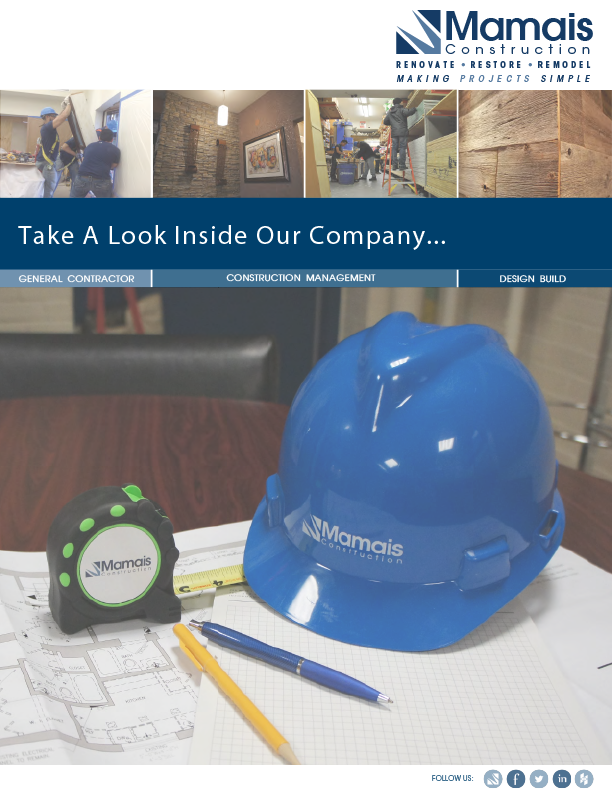 Mamais Construction, as a General Contractor, realizes the importance of preventing accidents that lead to jobsite injuries. Company management and all employees are committed to the performance of their duties in a safe manner and collectively maintain a safe work environment on all jobsites. To provide a guideline for management, a ‘Safety Checklist’ is created to ensure that a consistent, company approved process is used to manage safety on the worksite, and that critical issues are managed and enforced to the same level of consistency. Using the checklist, the Project Supervisor will conduct weekly Toolbox Meetings with employees to discuss worksite safety, perform equipment and tool inspections, and ensure the proper personal protective equipment (PPE) is made available when conditions dictate. Additionally, the Project Supervisor will perform unscheduled work site inspections on a weekly basis to ensure crews have appropriate personal protective equipment (PPE) and are following all safety measures and protocols. Any non-conformance issues are communicated verbally to the Site Supervisor and corrected immediately.